Campbell: Wrong Point? Or Just The Wrong Man To Front The Campaign? Sol Campbell has been in the news a lot recently, sometimes talking about Tottenham, sometimes not. However, given his recent accusations that he fell foul to institutional racism from the Football Association, old wounds were opened somewhat. Taking time to reflect on the whole affair, Jack Hussey explains that Sol Campbell is hated because of a once held love, rather than the colour of his skin. He also ponders the points raised about the captaincy of England - despite clearly being the wrong man to front the campaign, did Campbell inadvertently stumble on to a point after all? As a Spurs fan, within the pantomime narrative of football, Sol Campbell is a villain. The way in which his acrimonious switch to Arsenal played out cut deep. For anyone who can’t remember the transfer, who only knows of Sol Campbell as a figure of hate for Spurs fans, need only imagine Ledley King doing the same thing to truly appreciate Sol’s transformation from Legend to ‘Judas’. Some can’t even bear to speak or type his name, often replacing letters with stars, as they would more common expletives. My personal favourite is to call him rSol, but I digress. Rousing choruses of ‘Hey Sol Campbell’, a NSFW adaptation of Bruce Channel’s classic ‘Hey Baby’, still routinely ring around White Hart Lane. In 2008, as Spurs played away at Fratton Park against Campbell’s then team Portsmouth, a number of fans were arrested for singing a particularly vile rendition of their own version of ‘Lord of the Dance’. As abusive songs go, it’s definitely up there. The implication that the chant was racist is not a view that I have ever agreed with. Believing that the line “we don’t give a f___, if you’re hanging from a tree,” ties in with the Biblical narrative of Judas Iscariot and not the Klan lynchings that have been suggested. Regardless of this, the chant was hideous and showed an ugly side to our support. Sol has intimated on previous occasions that a lot of the vitriol he has faced from Spurs fans is due to the colour of his skin. Personally, I hate Sol because I loved him. Growing up through one of the worst eras of Tottenham’s history, he was always a shining light. Truly, a brilliant player that was the envy of world football, and he played for Spurs. Not only that, he came through our academy. He was Tottenham. We know where the tale goes from here. I know when I refer to him disparagingly; I do so because of the way he sold our affection down the river. I know that any rational and decent human being (well, as rational and as decent as you can be, when you say you hate someone over football) dislikes him for the same reason. 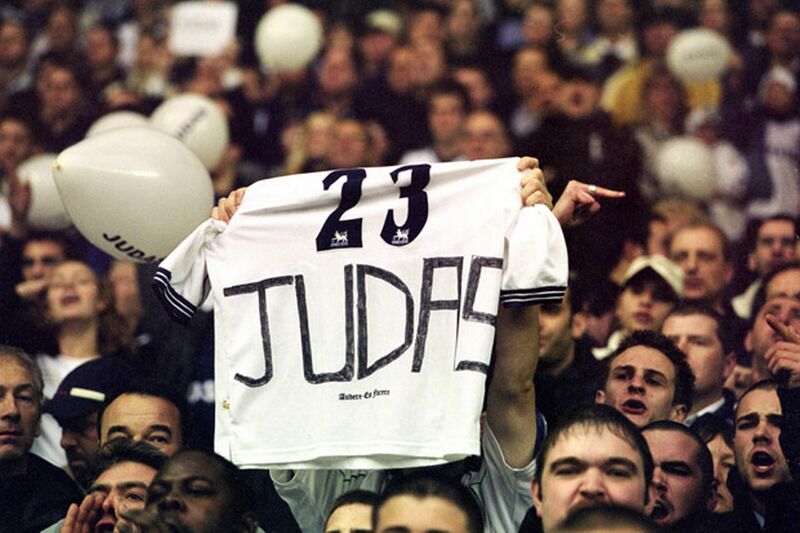 Do I assume, however, that Sol Campbell has never faced any racist abuse from Spurs fans? That none of their vitriol is motivated by racial hatred as well as his move to Arsenal? No. As much as we would like to think that racism doesn’t exist on our terraces anymore, it does. With my own ears I’ve heard both Adebayor and Gallas have the slur “black c____” hurled at them by one of my fellow ‘supporters’. I’ve heard Les Ferdinand referred to as “a f______ useless ape”. I’ve heard Lee Young-Pyo called “Ping Pong” and “Chinaman”. Sol’s claim that he would have been England captain for at least ten years, were he a white man, is in my opinion false. Questions over Sol’s personality have followed him from club to club. Even in Ledley King’s autobiography, which avoids controversy at every turn, he details Sol as a bit of a loner. As a very intense character who was never really one of the lads. Whatever my thoughts on his false claim to a decade of England captaincy, his comments have led me to inspect the state of the national team’s representation. The fact that the Three Lions have only been led onto the field by a black player on 17 occasions in their history, was something I found surprising and definitely uncomfortable. Upon further examination, you can also understand his feeling aggrieved, being overlooked for the captaincy in favour of Michael Owen. Despite his talent on the field, a quick listen to Michael’s commentary for BT Sport should throw into question quite how inspirational a choice of captain he was. It’s worth noting that for part of Sol’s international career, Paul Ince held the captaincy. Albeit only for a short while, this doesn’t support Sol’s theory. David Beckham held the armband for a large portion too, and in my opinion, justified that decision with his leadership skills, performances and passion for the national team. With Beckham also being the biggest ‘brand’ in world football at the time, you can understand the decision from a marketing perspective. Does this add credence to an argument of institutional racism within wider society? Potentially. But that’s one for another day. Despite not particularly liking the bloke, am I comfortable rejecting Sol Campbell’s claims of systemic racism plaguing football? No. To hold faith that the FA is above any scrutiny in it’s moral outlook is naïve. Consider this the same FA that looks the other way on issues of exploitive ticket pricing, overzealous policing and stewarding of fans and the lack of fight over the media’s criminalisation of football fans in general. More pertinently, the same FA that dished out such paltry punishment to Terry, Suarez and Anelka for racially motivated incidents. The same FA that fails to back organisations such as ‘Kick it Out’, and the same FA that fails to properly address the lack of minority coaches and non-playing professionals within the British game. Campbell is a man willing to speak his mind about racism, and it’s not to say that he’s always right, as his comments from the last Euros showed. It’s evident from the response on Twitter alone, that not all black people are united behind Sol’s sentiment on this matter either. Shock horror. Do I feel that the FA is institutionally racist? Probably. I do feel that inequality is a problem that needs addressing, as it hasn’t been dealt with sufficiently yet. But the seeds of change have been sown, and we will continue to see things improve, hopefully on and off the field. It embarrasses me as a white, Tottenham fan to see a predominantly white crowd greet a black man's concerns about systemic racism with “f___ off Judas, stop playing the victim”. Sometimes the curtain of supporter rivalry needs to be pushed aside to allow an issue the attention and discussion it requires. Sol may be misguided in his approach, so misguided that I feel he runs the risk of doing more damage than good in places. But I also have to ask the question, what has he experienced in order to feel that the colour of his skin is an issue at all? It’s our duty as human beings to look further at this, more than it is our duty as Spurs fans to dismiss him.